Booking a flight has never been so easy with internet access nowadays, where you just sit in front of your laptop a with just a few simple click, yes you can fly tomorrow or even tonight !!! 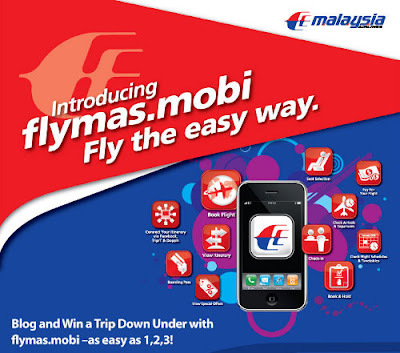 BUT now with MAS flymas.mobi, a mobile site where you can book your flights and check all necessary details from your mobile phone, I must say FLYING HAS NEVER EVER BEEN SO EASY LIKE 1, 2 , 3. I don't even need a laptop & modem to go online to buy an air ticket !!! I think even my mother can book her airticket herself next time around... hehe !!!! So why not choose to Fly the Easy Way ? When hand phone was invented moons ago, no one ever thought that that we can have video calls & gps and now we can even book air ticket online !!!! Who has ever imagine this .... its so convenient that if I have the sudden urge to go Bangkok to finish my unfinished business, then I can book wherever and whenever I wanted, be it at the malls where I am doing my crazy haul, driving (okay lah u book when u have traffic jam okay!) and even when u are in toilet business !!! Just access http://flymas.mobi and you’ll be able to navigate your way through it easily as the site is built for mobile access! Also what's more, if today you share this good news with your friends on your blog , you stand a chance to win Free flights from MAS to Australia, ASEAN countries and domestic!! 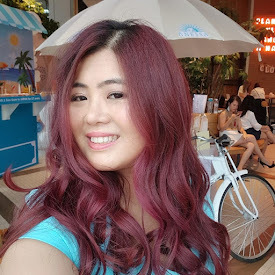 p/s: Anyone want join me to go Bangkok for shopping ?? But I want to win a trip to Australia, never been there YET!! !